North Attleboro – Division 2 South Champions (Courtesy photo). Franklin – Division 1 Central Champions (Courtesy photo). Mansfield – Division 1 South Champions (Courtesy photo). Click here for a photo gallery from the Hock Super Quad at Sharon High. Click here for a photo gallery from the Hock Super Quad at Foxboro High. 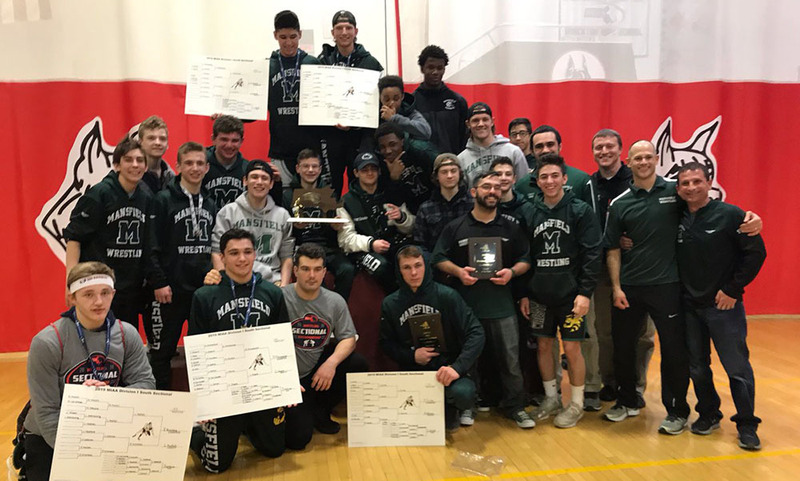 Three Hockomock teams claimed sectional titles on Saturday, five others finished inside the top five, and 26 grapplers claimed individual sectional titles. Franklin dominated the D1 Central bracket, racking up 272 points behind six individual champions, two finalists, and two third-place finishes. The Panthers had over a 50 point cushion over second place Brookline. 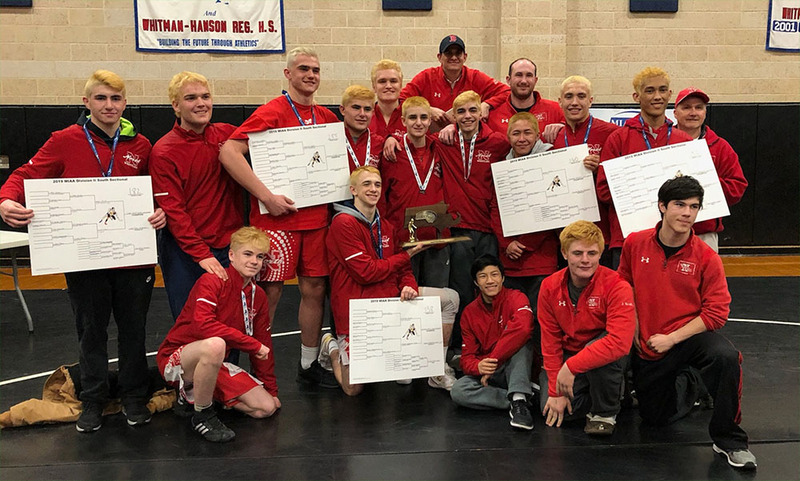 In the South section, Mansfield repeated as D1 South champions by edging out host Brockton, and North Attleboro snagged another D2 South title with six individual champions. Foxboro earned second place in D3 South with an impressive 13 wrestlers finishing sixth or better at the tournament. Oliver Ames had its best ever finish at sectionals, taking third place in the D2 South bracket while Sharon took fifth overall. King Philip took third place in the D2 Central sectional, edging out Milford by a half of a point. Stoughton tied for seventh place in D2 South, Canton earned eighth in D2 Central, and Taunton placed 11th in D1 South. Franklin’s Drew DiFilippo earned the D1 Central sectional title at 106 with a 7-0 decision. He scored all seven of his points in the first round, earning a takedown and then a pair of near falls. Jake Carlucci picked up a 7-4 win in the 113 final, using an escape and a late reversal to seal the title. Jordan Carlucci dominated in the 132 final, scoring nine straight points after the match was tied at 2-2 early on, and Ken Sauer won the 138 championship with an impressive 9-1 decision, only allowing an escape late in the third period. Dominic Sackley was the fifth Panther to win a title, using an escape and takedown in the second, and a takedown in the third to secure a 7-1 decision. And Matt Leofanti scored an upset in the 220 final, using a second period takedown and a third period escape to upend the top seed, 3-1. Caleb MacLean (160) and Riley Downing (285) earned second, Alex Fracassa (126) and Dylan Nawn (182) were both third, and Ben Jacoby (195) was fourth. A year after Mansfield claimed its first sectional title, the Hornets grabbed their second D1 South crown in a row. Will Stratton needed less than two minutes to get a pinfall victory in the 145 title match, and George Glaropoulos had a similar performance in the 160 championship, earning the title by pinfall in 1:31. After a scoreless first period, CJ Glaropoulos scored a reversal in the second and a takedown in the third to secure the D1 South title at 152. Jayden Curley cruised through the 170 bracket in impressive fashion, pinning his first two opponents in under a minute, winning his semifinal match via pinfall in 1:34, and then took the title with a pin in just 33 seconds. Ethan Nirenberg was Mansfield’s fifth winner, using a second period escape and a near fall in the third to win 4-0. Antonios Sevastos added a second place finish, and Stefan Steyn earned third for the Hornets. Taunton’s Jackson Wellman, in his first year wrestling, earned third at 182 and Christian Balmain took home fourth. 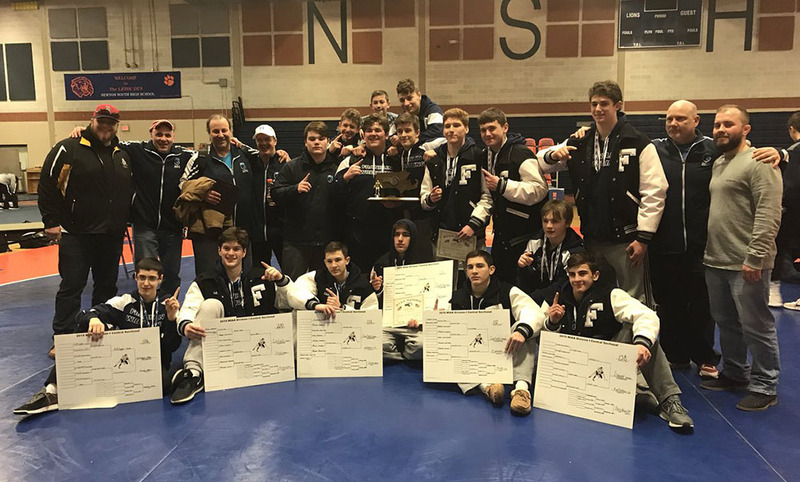 Of the 14 champions in Division 2 South, nine came from Hockomock teams with North Attleboro having six winners and Oliver Ames taking three individual titles. After a tech fall and a decision to reach the final, North Attleboro’s Mike Burns earned a first round pin to win the 138 crown. Two weight classes later, North’s Michael Edmonds scored all of his points in the second and third rounds, overcoming a 5-0 first round deficit to stun top-seeded Tristan Williamson of Hingham for the 152 D2 South championship. Montrel Jackson followed suit, scoring a second round pin to upset top-seeded Declan Byrne of Pembroke. In the 220 final, John Kummer added another upset win for the Rocketeers, getting five points in the final 31 seconds to knock off top-seeded Will Dion of Plymouth North by a score of 8-3. Liam Rizk was trailing 6-2 in the 220 match before securing a pinfall victory, and Mateusz Kudra needed just over a minute to get a pin over Stoughton’s Calvin LaGuerre in the 285 final for North’s sixth individual title. Oliver Ames’ Nick McGovern had a big day, earning two pins to advance to the semifinals, then knocked off #2 Vinay Chinnam of Sharon, 13-10. In the final, McGovern shocked top-seeded David White of Hingham with a second period pinfall. Billy Tat (170) earned the title with a first round pin, and Dean Pacini secured the 195 crown with a third round pin. Also in D2 South, North Attleboro’s Ethan Smith (120) was second, and Jon Lozinski (132) and Matt Warsofsky (170) both placed third. OA freshman John Dobbin continued his strong rookie season by taking second in the 106 bracket, and Max Anderson (220), Nelson Malone (132), and Remi Creighton (120) all earned fourth place finishes. Sharon had five grapplers take third place including Alex Bolt (195), Amit Levin (120), Huguens Pierre (138), Jon Wald (182), and Tyler Cashton (152) while Andrew Ableman (160) and Vinay Chinnam (126) finished fourth. On top of LaGuerre’s second place finish in the heavyweight bracket, Stoughton’s John Santos (113) took third overall, and CJ Carpenter (106) was fourth. All three Hockomock teams in the D2 Central tournament earned at least one individual champion. King Philip had a pair of champions as Luke Fitch (182), and Shawn Conniff (195) earned back-to-back pinfall victories. Conniff earned an upset in the final, knocking off top-seeded Alex Childs of Nashoba. Mohammad Lofti (145) and Yousef Lotfi (285) both finished second for the Warriors and Benjamin Leclair (113) and Noah Riedel (138) each finished fourth. Milford will be sending six wrestlers to states, highlighted by Carlos Terrinha, who won the D1 Central title at 120. After winning the first two matches by fall, Terrinha earned the title with a 10-3 decision. Nick Marcolini (152) finished second, Dan Pinto (138), Dylan Ortiz (132), and Joao Neiva (195) each took third, and Evan Hazard (126) was fourth overall. Canton’s Cole Murphy won his first sectional title, earning a pinfall victory (his second of the day) in the 170 final to get the win. Harry Carter (132) and Zach Peters (106) each took second, and Mark Carstairs (120) finished third overall for the Bulldogs. Foxboro had a terrific showing at the D3 Sectional, having a wrestler place sixth or better in all but one weight class. The Warriors, who finished second to Norton in the team standings, had three individual champions. Shayne Kerrigan (132) won by pinfall in his first two matches and then picked up a pair of decisions, the latter a 7-1 win in the finals to get the title. Tommy Gallagher (138) followed Kerrigan’s title win up with one of his own, earning a pin in his first match, a 2-0 decision in the semifinals, and then a 6-3 decision in the finals, highlighted by a nearfall in the third period. William Ogebebor (220) was the third Warrior to win a sectional title, needing just 30 seconds to win his first match, advancing to the final with a 5-0 win in the semifinal, and then an 8-2 decision to become the champion. Foxboro’s Adam Lanctot (120), Tom Cullen (170), and William McNeil (285) each finished third while Matt Sharkey (145) and Sean Bubencik (106) each took fourth place. Canton, 34 @ Bishop Feehan, 69 – Final – Canton was limited to just two points in the second quarter as the Shamrocks built a 34-10 lead at halftime and never looked back. Bulldog sophomore Matt Giglio scored a team-high 12 points while Peter Hayward added eight points. Franklin, 5 @ Attleboro, 0 – Final – Scott Elliott scored a pair of goals and three other Panthers found the back of the net as Franklin skated to a shutout win over Attleboro. Senior Joey Lizotte, senior Zac Falvey, and sophomore Declan Lovett also scored for the Panthers in the win. Canton, 5 @ Oliver Ames, 2 – Final – Click here for a recap and photo gallery of this game. Canton, 1 vs. Westwood, 1 – Final – Canton sophomore Lizzie Tassinari scored with 1:41 left in the game to help the Bulldogs earn a tie in what felt like a championship level game according to CHS head coach Dennis Aldrich. Franklin, 6 vs. Medway, 3 – Final – Franklin senior Cassi Ronan scored a hat trick to pace the Panthers to a win over Medway at home on Saturday night. Ronan also had an assist while Regan Paterson and Gianna Cameron scored once. Libby Carter, Katelyn Brown, and Tina Pisano added assists while Gabby Colace made 12 saves to earn the win. Mansfield/Oliver Ames, 1 vs. Dedham, 1 – Final – Dedham scored on a shorthanded goal in the second period but MOA responded within two minutes to tie the game, and that ended up as the final score. Ella Waryas connected with Kylie O’Keefe, and she in turn hit a streaking Emma Garland, who tucked the puck through the goalie’s pads to tie the game. Warrior freshman goalie Jess Widdop had a standout game, making 30 saves. Foxboro Quad (Foxboro) – Foxboro hosted Carver, Hanover, and Hingham for a quad meet, picking up two wins but suffering a loss to the Harbormen. The Warriors defeated Carver (84-0) and Hanover (58-21) but lost 44-36 to Hingham. TJ Whitehouse (113), Adam Lanctot (120), Tom Cullen (170), William Ogbebor (220), and Billy McNeil (285) each went 3-0 on the day for Foxboro. Algonquin Quad (Franklin) – Franklin picked up three impressive wins at the Algonquin quad, including a dramatic come-from-behind victory. The Panthers beat Framingham (36-29), Algonquin (49-12) and used a last match pin from Drew DiFilippo to secure a 33-28 win over West Springfield. Dominic Sackley went 3-0 for Franklin with three pins. Cumberland Meet (North Attleboro, Oliver Ames) – In a tournament featuring some of the top teams from around New England, North Attleboro took fifth place with 122 points and Oliver Ames was eighth overall with 85.5 at the John Gorman Invitational. North Attleboro senior Mateusz Kudra (2850 remained unbeaten on the season, picking up three pins to advance to the final where he earned a 7-0 decision over second-seeded Edison Guarcas of Hope High School. Liam Rizk (182) added a third place finish for the Rocketeers while Michael Burns (138) and Ethan Smith (120) each took fourth overall. Oliver Ames’ Dean Pacini (195) picked up an individual title with an upset in the final round. Pacini had three wins to get to the final, and trailed top-seeded Kaream Sangare of Cumberland High 4-1 after the first round. Pacini was down 6-3 late in the third round before earning a takedown and getting at pin at 5:31 for the title. Billy Tat (170) added a third place finish for the Tigers, Remi Creighton (113) was sixth, and Nick McGovern (120) went 4-2 on the day. St. John’s Shrewsbury Quad (Sharon) – Sharon picked up a pair of wins at the St. John’s Shrewsbury quad. The Eagles recorded victories over the hosts (57-12) and Marlboro (34-32) but came up short against powerhouse Masconomet (42-33). Jon Wald (182) and Amit Levin (120) each went unbeaten on the day while Nathan Daley (285) earned his first varsity win. Methuen Quad (Mansfield, Taunton) – Mansfield earned three wins while Taunton picked up one at a super quad at Methuen High School. The Hornets beat Monty Tech (46-14), Silver Lake (58-9), and Marshfield (48-18) but lost to host Methuen (34-31) in a close match. Taunton recorded a win over Monty Tech (45-21). Mansfield’s Antonios Sevastos, CJ Glaropoulos, George Glaropoulos, Jayden Curley, and Ethan Nirenberg were all undefeated throughout the day. Taunton’s Tyler Lima (120, dec. 6-5), Wansly Perceval (126, pin), and Mason Frank (285, pin) picked up wins in the victory over Monty Tech. Attleboro, 44 vs. Cumberland, 24 – Final – Attleboro bounced back from last night’s loss with a strong defensive performance to earn its first win of the season. Mackenzie Roberts had 11 points to lead the Bombardiers, Liv McCall scored nine, and Jordyn Lako had eight points and 11 rebounds. Attleboro coach Marty Crowley added that senior Dom Garnes gave the Bombardiers great defense off the bench. Canton, 7 vs. Plymouth South, 2 – Final – Canton senior Ryan Nolte scored a hat trick and junior Chris Lavoie found the back of the net twice as Canton opened its season with a win over Plymouth South. The Bulldogs will play Plymouth North in the final of the Jim Gormley Cup on Saturday at 4:00 at Gallo. Mansfield, 4 vs. Walpole, 1 – Final – Mansfield built a 2-0 lead after the first period, extended it to 3-1 in the second, and added an insurance goal in the third to pick up its second win of the season. The Hornets had four different goal scorers with Matt Copponi, Brad Grant, Jack Garland, and Ben Ierardo each lighting the lamp. Copponi, Grant, and Austin Ricker each had assists. The Hornets cashed in twice on the power play and went 3-for-3 on the penalty kill. Stoughton, 1 vs. Cardinal Spellman, 5 – Final – Carter Gerome scored the lone goal in the Black Knights’ season-opener. Canton, 4 vs. Plymouth South, 0 – Final – Maggie Malloy scored a pair of goals and added an assist as Canton improved to 2-0 on the season. Ava Pacitti made 11 saves in net to earn the shutout. Franklin, 4 vs. Medway, 3 – Final – Cassi Ronan scored a pair of goals and Regan Paterson and Libby Carter each tallied once to lift the Panthers to a season-opening win. Canton, 36 @ Oliver Ames, 31 – Final – Remi Creighton, Nick McGovern, Billy Tat, Andrew Fraser, and Dean Pacini all earned wins for Oliver Ames but the Tigers suffered a setback to Canton. North Attleboro, 27 @ Mansfield, 45 – Final – Click here for a photo gallery from this match. – Mansfield showed off its strength, experience, and versatility in the middle weights to earn a non-league win against North Attleboro. The Hornets led 33-0 after starting the meet at 120 pounds. Antonios Sevastos earned a 10-3 win to start the Hornets off with four points and Andy Triantafilopoulos followed with a 17-2 win at 126. Steven Chase earned a pin at 132 and Stefan Steyn won 2-0 at 138. Will Stratton won at 145 and CJ and George Glaropoulos each followed with pins. Montrell Jackson got North’s first team points with a pin, coming back from 6-1 down in the first and 8-6 down in the third to make it 33-6. Jayden Curley answered back with a pin at 182, but North won three straight matches to cut into the lead. Liam Rizk won at 195 and then John Kummer (220), Mateusz Kudra (285), and Tanner Ferguson (106) had back-to-back-to-back pins. Max Farley closed the meet for the Hornets with a pin at 113. Sharon, 69 @ Taunton, 12 – Final – The Eagles had 10 wrestlers win by pinfall to earn a win over Taunton. Adam Landstein (106), Ben Shocket (113), Amit Levin (120), Vinay Chinnam (126), Aaron Cashton (132), Kevin Simons (138), Tyler Cashton (145), Andrew Ableman (160), Jon Wald (182), and Alex Bolt (195) each earned a victory by fall for Sharon. Taunton’s Corey Abelard (220) and Mason Frank (285) each win by pinfall in under a minute. Canton, 81 @ King Philip, 88 – Final – King Philip captains Tyler Stringfellow and Colby Vieira both had strong performances in the first meet of the season for the Warriors. Stringfellow won the 50 free while Vieira took first in the 100 fly and 10 backstroke. Cameron Stringfellow, John Dionis, and Dean Whyte added first place finishes, while Jackson Klein and Andrew Pham were consistent point scorers as well. Canton, 89 @ King Philip, 79 – Final – King Philip’s Megan Campbell, Jess Sullivan, Cate Digiacomo, and Morgan Sachleben put forth a strong effort with first places finishes for the Warriors.